We are a different type of solar company. We seek to solve our clients energy problems by developing creative solar options in order to help them save time, resources, and headaches. Often times, running power is simply not feasible or is too costly. We develop custom solar options to get power where you need it most. We can customize ANYTHING that uses power to run off solar. 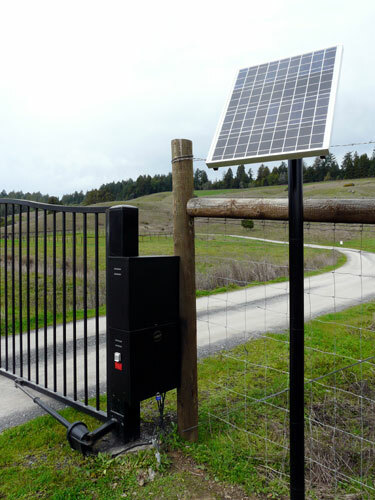 Whether you need a gate powered for your home or for your business, our custom designed Solar Gate openers provide a cost effective solution to running power to your gate location. Our solar gates store energy in batteries and are off-grid. This means that your gate will have an operation energy cost of ZERO! We design and build custom solar water pumps in order to prevent our clients from running generators or routing traditional power from the grid to their water supplies. Our solar water pumps can be used to pump water for livestock, crop irrigation, or even sprinkler controls. When you are in a remote location, running power is not only expensive, it may not be feasible. Our team designs and installs custom solar systems to make sure your cabin has the power that you need. Whether you need to power small appliances, light an entire structure, or run large equipment, we can create a solar solution that make sense for you.